Change a "Won't to a Will"
How the educated rider responds to a horse’s disobedience will depend on how she reads the horse’s behavior. If the horse doesn’t understand, the rider needs to explain the request more clearly. If the horse is afraid, he needs the rider to help him feel safe. And if he is blowing his rider off, he needs a greater incentive to pay attention and do as he is asked. A rider is finishing up her third ride on her new horse. He has been calm and willing in the arena, and she decides to take him out on the trail. She brings him up to the gate to open it, but he refuses to line up with the gate and stand still for her to reach the latch. His ears are on her, listening as she tries to get him into position, but he keeps backing up and moving away from the gate. The rider leaves the arena and heads into the woods. As the horse gets further from the barn, his walk quickens, his body tightens and his head comes up. Suddenly he stops, breathing hard. He seems fixated on a point up ahead. 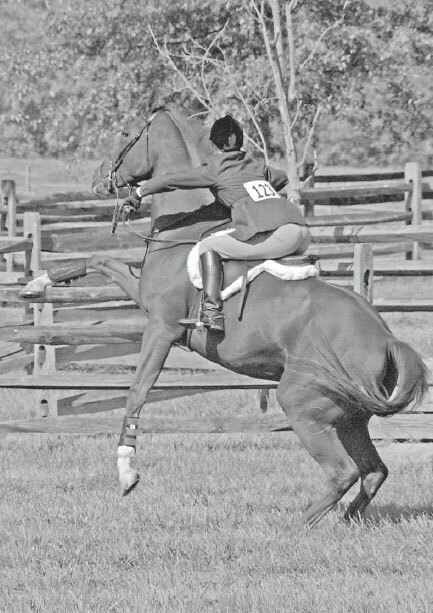 The rider nudges him forward with her legs, but the horse refuses to go. He stands stock still as if rooted to the ground. When horses are afraid, they generally have one of two responses: they flee and ask questions later, or they freeze to assess the situation and then flee if they detect a threat. A “freezer” can be harder to read as afraid − often people think that the horse is just being stubborn. But a horse that becomes unresponsive when he’s anxious can be dangerous, because if he decides there is a threat, he might “unfreeze” and want to get away. Quickly. The best thing to do is to notice early when your horse is getting worried. The rider in this example had some clues: her horse sped up, his body got tight, and his head carriage changed as they left the area where he felt safe. Stopping or turning back before the horse freezes, letting the horse relax in an area where he feels safe, and then heading out again will help to build the horse’s confidence in his environment and trust that his rider will not overface him. Horse and rider come to a field where other horses are being ridden. The rider wants to trot around but her horse has other plans. He wants to visit with the other horses. When she asks him to move up into a trot he ignores her leg and stays in the walk, looking at the other horses. 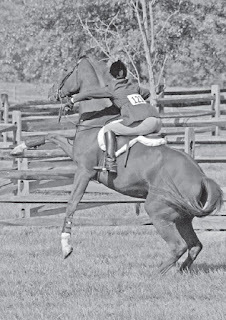 The horse that blows off his rider’s request thinks something else is a higher priority. The rider should not see this as rudeness, but instead as a challenge to be more engaging for him! To recapture the horse’s attention, pick a simple request that he knows, such as flexing him to the left. Start with the softest pressure possible, then gradually increase pressure until he responds. When he gives slightly, immediately release pressure. Then slowly start again. Stay with the same request until he is giving you an ear at the softest pressure, and responding consistently every time. Once you have that, you have his attention and you’ll need to do something interesting with it so you don’t lose it again. Transitions and changes of direction are a great way to keep a horse on his toes. Don’t forget to reward your horse with a rest when he starts to keep an ear on you and responds softly and consistently to your requests. You are rewarding him for keeping his mind on you just as much as for the transitions.es. Once you understand the reason behind the “won’t”, one of the strategies described above can help you shape it into a “will.” Willingness is a habit, not a permanent condition. It can be lost; it can be developed. It should be practiced like a skill and rewarded like the gift that it is!